Nomads (Kooch Neshinan) in Iran are a group of people who travel and move from one place to another along with their tribe, family and all their belongings. Kooch Neshini (Nomadism) is the tribal lifestyle and their economy is based on herding. Shifting from one place to another and moving as a large group are the most important aspects of Nomadic life. Nomads move to Yeylagh (cooler countryside) in summer and back to Gheshlagh (warmer areas) in winter throughout their yearly and shift with the seasons Iran’s Nomadic tour is an opportunity to visit this great attraction that is still present in the 21st century. 7 days tour of Iran’s Nomads is an exciting touring program that allows you to learn about the culture of Nomads and experience their life along with one of main tribes called The Great Tribe of Qashqai. Through this tour you get to live their life, taste their wood stove cooked local food, see their style of animal herding and understand their customs. Visiting “Margoon” one of the most beautiful waterfalls of Iran. Visiting Tange Boragh, a beautiful valley close to a village with the same name. Tasting local wood stove cooked local food, see their style of animal herding and understand their customs. 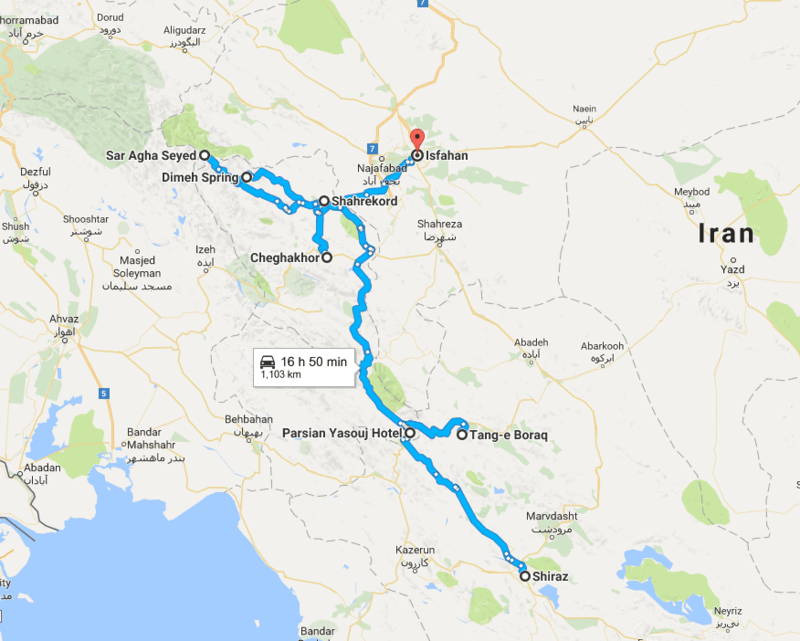 Our trip starts in Shiraz by heading to Yasouj early in the morning. Yasouj is the center of Kohgiluyeh and Boyer-Ahmad province, populated by the Lor people of south-western Iran. This city has been inhabited since the Bronze Age. On our way to Yasouj, we will visit “Margoon” one of the most beautiful waterfalls of Iran. We end the day at the Yasouj Tourist Complex located at the top of a beautiful hill overlooking the city presenting a stunning view. Early in the morning after breakfast, we will leave Yasouj for the Qashqai tents in an area between Sadeh and Eghlid (two famous regions of the province). Spending 2 nights in the Nomads’ tents you will experience Nomadic lifestyle and depending on the guests’ desire, we can do some mountain climbing which surely will be one of the most interesting parts of the trip. You will be heading to a very beautiful area with pleasant weather. Tang-e Boragh is a beautiful valley close to a village with the same name. This village is located in a highland region surrounded by eye-catching landscapes including green fields around the village, vast forests and gardens especially during spring and summer which creates a pleasant ambience for visitors. In Tang-e Boragh you will see a waterfall, straits, caves and plains all at the same time. This village has been a Yeylagh (cool countryside) location for Nomads on their way to Eghlid 2 centuries ago. The local language of this region is Lori and Turkish. They are mostly Shia Muslims and their main occupation is farming, ranching and handcrafts. Their products they produce include rice, wheat, beans, apple, peach, yoghurt, butter, dough and curd. Their handicraft consists of carpet and rug weaving. Tang-e Boragh is a residential village with flat-roofed houses surrounded by gardens and green forests spread on the gentle slopes of the mountain range. At the end of the day, you will be back to rest and relax in your nomadic tents. It would certainly be nice to stay in a hotel after 2 nights of sleeping in the nomadic tents. This leads us to Shahr-e Kord for a night of fabulous memories. People from this region go back to their Kurd nomad ancestors who moved to this area for the benefit of its green fields and meadows. With its height of 2050 to 2310 meters above sea level, it is known as the highest city in Iran and that is why it is called the “The Roof of Iran”. After residing at Azadi Hotel of Shahr-e Kurd, having lunch and a short rest, we head for the enchanting lagoon of Chagha Khor. This is the only place that there is snow on the grass, storks beside the fish and fountains flowing as the willows swing as you can see them twice in reflection of the wetland. The quadruple lagoons that have spread like a chain from the south side of Borujen city along Kalar Mountain towards the west, have created a large biological complex suitable for migrating birds and unique species of fish, turning Chaharmahal and Bakhtiari province to one of major habitats for migrating birds and waterfowls traveling through Europe and Russia passing the northern provinces of Iran towards the countries on the coast of the Persian Gulf. This day we will visit Saman city after breakfast. Locating at the shores of the Zayandeh River. Saman is known for its farming, gardening and tourism attractions. Due to the special geographical situation, the city’s famous agricultural products are production of crops such as almonds and walnuts. People of this city are mostly Qashqai and they speak the Turkish language with a Qashqai dialect. Zaman Khan Nafar Bridge, from the Safavid period, is one of the valuable ancient sites in the city. After touring Saman, we will head back to hotel for lunch. After lunch our destination will be Koohrang. This city has been named after the colorful vegetation of the mountains of the region. Kooh means Mountain and Rang means Color. Koohrang city due to its abundant natural attractions and springs is a tourist, resort, tribal and active city. Travelling to Koohrang, we will visit the beautiful waterfalls and springs of the region and head to Dimeh spring for rest and relaxation. In Koohrang we will stay in a Nomadic Camp. We will experience two memorable nights in this camp where it will be possible for them to witness the Nomadic lifestyle and watch the ceremonies and customs of Nomads while having the opportunity of horseback riding, shooting, watching local dancing and enjoying local foods. On the sixth day we will visit Shaikh Alikhan waterfall close to the camp and also the astonishing village of Sar Agha Seyed. Bearing 600 years of age, Sar Agha Seyed is one of the most unique villages of the Iranian central plateau and particularly in the Zagros region. Due to the historical context, this village is known as Masouleh the second. All the houses are brick-built and are located in a way that the yard of one house is the roof of the lower house. The villagers’ occupation other than farming and livestock is mostly salt extraction from the nearby springs. Salt ponds are a commercial location for these people whom have put their lives on the line for this work. This extraction is used for cooking, livestock, for commercial sale or could be a souvenir of a trip to Sar Agha Seyed. Other than housework and working in salt ponds, women of this village make many handcraft products such as carpets, jajims, tents and kilims. Their carpets are woven with natural colored wool using natural shapes, using Lachak and Bergamot designs. However, their main souvenirs are dairy products such as milk, dough, curd, yogurt and butter. On the seventh and the last day of our trip we will visit Koohrang tunnel and waterfall as well as Dimeh Spring which is the name of the spring by a village of the same name in Koohrang. It is also one of Zayandeh river’s main branches located 10 kilometers northeast of Chelgard. Dimeh generates one of the freshest waters in the world, rich in minerals and calcium full of health benefits. Dineh Spring offers eye-catching views and the ambience of a beautiful resort. Dimeh is a natural phenomenon that has been listed as a place of natural heritage significance by the Cultural Heritage Organization of Iran. Dimeh Village is close to Koohrang and this beautiful spring. This village due to its flourishing sites and the excellent surrounding views has always been one of the gathering places for Bakhtiari Nomads and tourists. This day will be the last day of our Nomadic tour. After Dimeh Village, we will head to Esfahan. Prices listed are on a per person basis, sharing accommodation (unless otherwise stated). Prices do not include international flights.